No Hidden Fees, Real Prices for Clean Cars with Real People. Great financing rates and terms available. 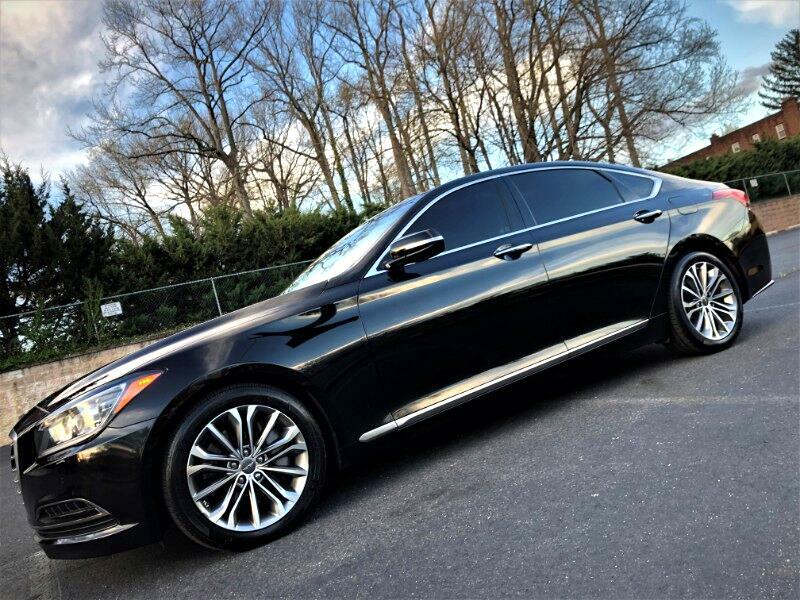 2015 Hyundai Genesis Sedan AWD with 3.8L V6 Engine Providing 311 Horsepower, Premium Luxurious and Technological Features. 1 Owner, No Accidents, Off Lease Vehicle (Not A Rental or A Fleet Vehicle). DEALER MAINTAINED RECORDS AVAILABLE. All servicing up to date with BRAND NEW TIRES, BRAKES AND ROTORS Just Installed. Technology Package-Navigation System, Backup Camera, Power Tilt-And-Slide Panoramic Sunroof, Adaptive Cruise Control, Blind Spot Detection System, Power Heated & Cooled Front Bucket Seats, Rear Heated Seats, Front & Rear Parking Assistance System, Lane Keep Assist, Bluetooth, Streaming Bluetooth Audio, Rear Cross-Traffic Alert, Lane Change Assist, Power Rear Sunshade, Manual Rear Side Shades, Lexicon Discrete Logic 7 Surround Sound System W/14 High Efficiency Speakers, Automatic High Beam Assist, Sensor Fusion Technology. Other Features-Leather Seats, Heated Steering Wheel, HD Radio, Bluetooth, USB Port, Aux Port, SD Card Reader, Heated Side-View Mirrors, Adaptive Headlights, LED Daytime Running Lights, LED Taillight Cluster, Fog Lights, Adjustable Anti-Whiplash Front Head Restraints, Auto Dimming Outside Mirrors and more. Bumper to Bumper Warranty Until March of 2020 Or until odometer reads 60,000 Miles. Powertrain/Drivetrain Warranty Until March Of 2020 Or until odometer reads 60,000 Miles. Emissions Warranty Until March Of 2023 Or until odometer reads 80,000 Miles. *Eligible for purchase of comprehensive bumper to bumper coverage with duration up to year 2026 or until odometer reads 125k miles. Bumper to Bumper Warranty Until March of 2020 Or until odometer reads 60,000 Miles. Powertrain/Drivetrain Warranty Until March Of 2020 Or until odometer reads 60,000 Miles. Emissions Warranty Until March Of 2023 Or until odometer reads 80,000 Miles. *Eligible for purchase of comprehensive bumper to bumper coverage with duration up to year 2026 or until odometer reads 125k miles.